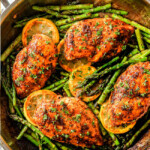 This Lemon Pepper Chicken with Asparagus is on your table in just 20 Minutes! It’s outrageously delicious with juicy, seared chicken breasts, crisp-tender asparagus and better-for-you buttery lemon garlic herb sauce. It is not only full of flavor but made with pantry staples that all cook in one skillet for easy prep and cleanup, and the perfect dinner for busy weeknights. You can just cook the lemon pepper chicken or cook the lemon chicken and asparagus or swap out the asparagus for whatever veggies you love or have on hand. Serve it with rice, pasta or mashed potatoes or low carb zoodles, cauliflower rice etc. No matter how you serve easy Lemon Pepper Chicken, everyone will be singing your praises, and licking their plates. Add lemon pepper, garlic powder, onion powder, paprika and salt to a large bowl and whisk together with 1 tablespoon olive oil and 1 tablespoon lemon juice. Add chicken and evenly coat, massaging spices into chicken. Let sit at room temperature 15-30 minutes, time permitting (you can prep your garlic, asparagus, etc. at this time). Melt one tablespoon Brummel and Brown® Original Spread with one tablespoon olive oil in a large skillet over medium high heat. Add chicken and cook for 3-4 minutes until golden. Flip chicken over and add garlic and 2 tablespoons Brummel and Brown® Original Spread to the middle of the pan and sauté 30 seconds. Reduce heat to medium and stir in chicken broth, lemon juice, oregano, parsley and thyme. Spoon sauce over chicken a few times, cover chicken, and cook an additional 3-5 minutes (depending on thickness) or until chicken is cooked through/registers 165 degrees F. Remove chicken to a plate and tent with foil. Add the asparagus to the pan with the remaining sauce and sauté until crisp tender, 3-4 minutes. Add chicken back to the pan along with any accumulated juices and warm for a minute. Serve with rice, potatoes, pasta, etc. *For juicer chicken breasts, brine before seasoning by combine 4 cups warm water with 1/4 cup kosher salt together in a glass dish. Stir until the salt dissolves. Add chicken and let sit at room temperature for 15-30 minutes. Remove chicken from the brine, rinse in cold water and pat dry.